Hello, my wonderful friends. 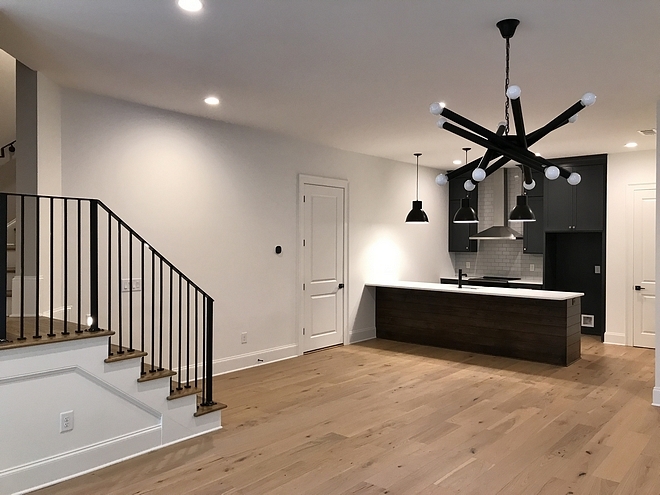 It’s great to come back here with a new post for you guys and I am excited to share this new-construction home and the floor plan. 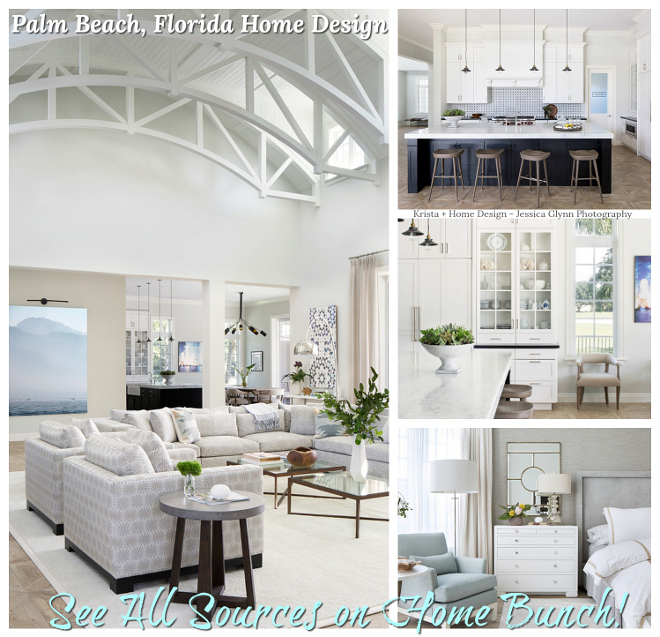 I often get emails from readers requesting to see the floor plan of the homes I feature on Home Bunch, but most architects and builders do not share the floor plan because they tend to be customized for the clients, therefore they keep them private. 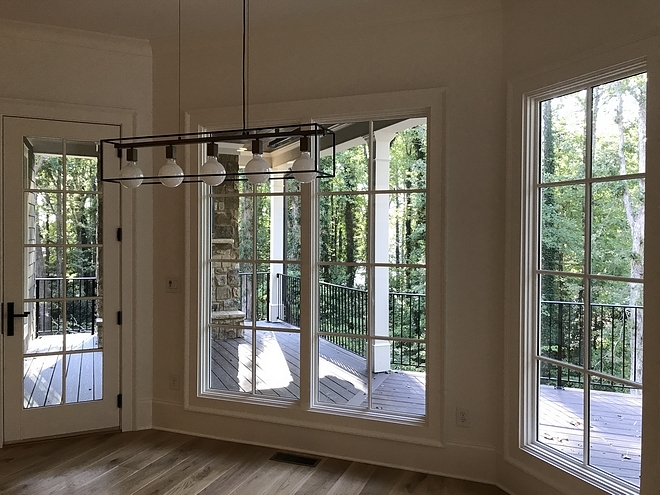 We are very lucky to have the architect and builder, Todd W. Reed of Reed Brothers Design & Build (previously feature here), willing to share all of the details of this beautiful home with us. 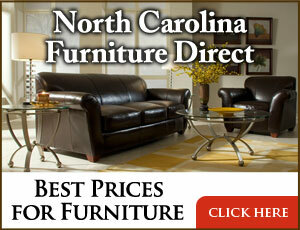 Take notes, get inspired and be ready to plan your new home inspiration! 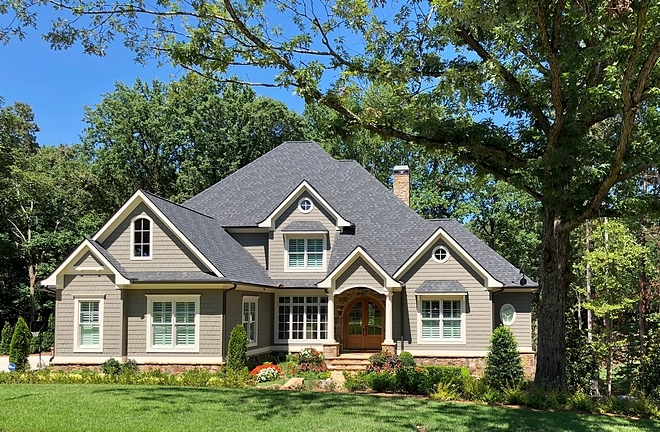 This newly-built home features gorgeous roof lines, transoms and round windows. 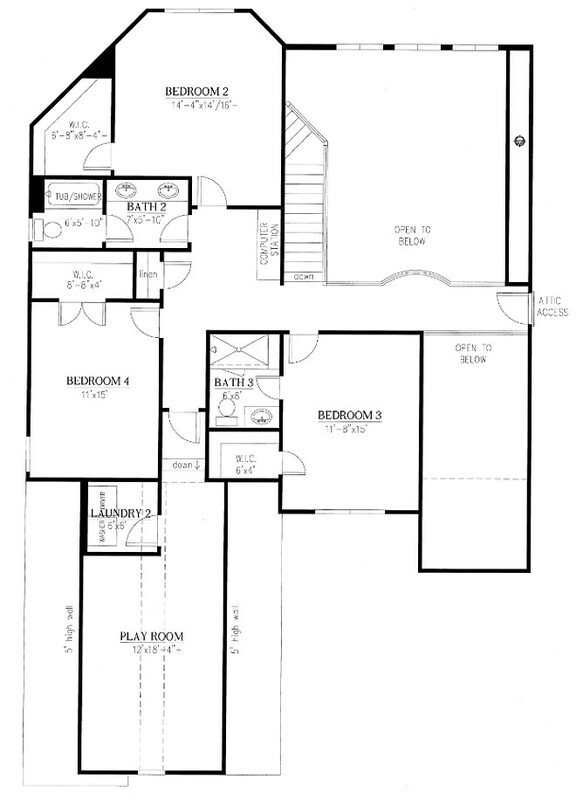 Size: 5,446 sqft of Living area. 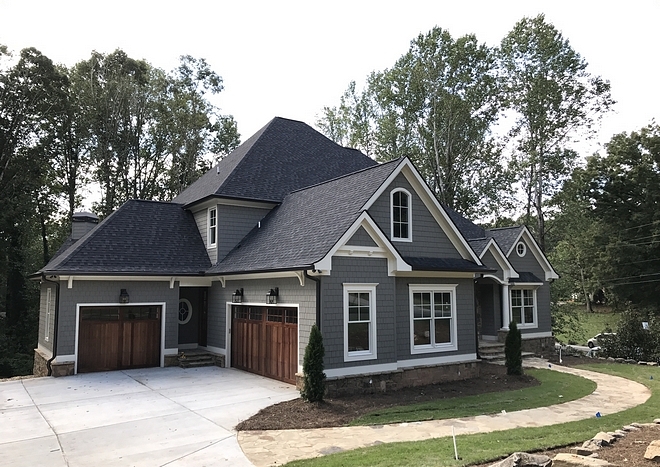 The exterior paint color is Sherwin Williams Anonymous SW 7046. 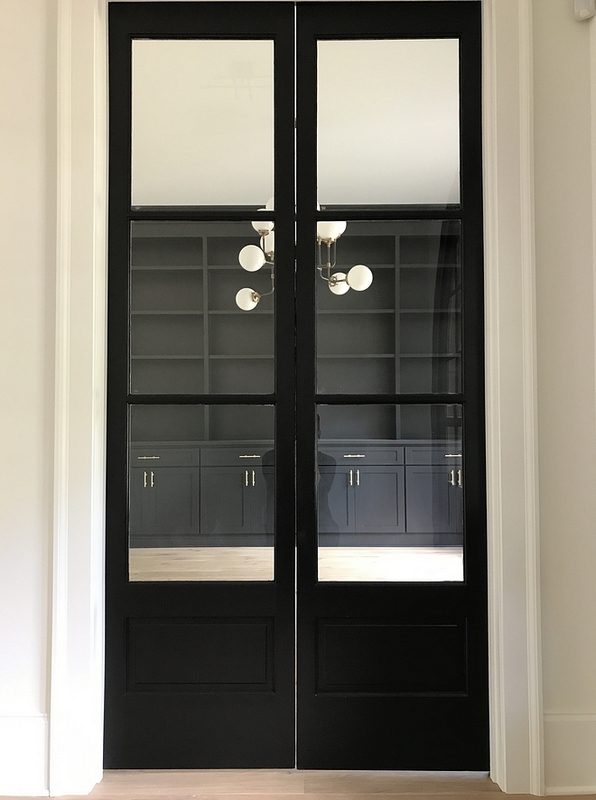 Front Door: Tucker – Stained Mahogany. 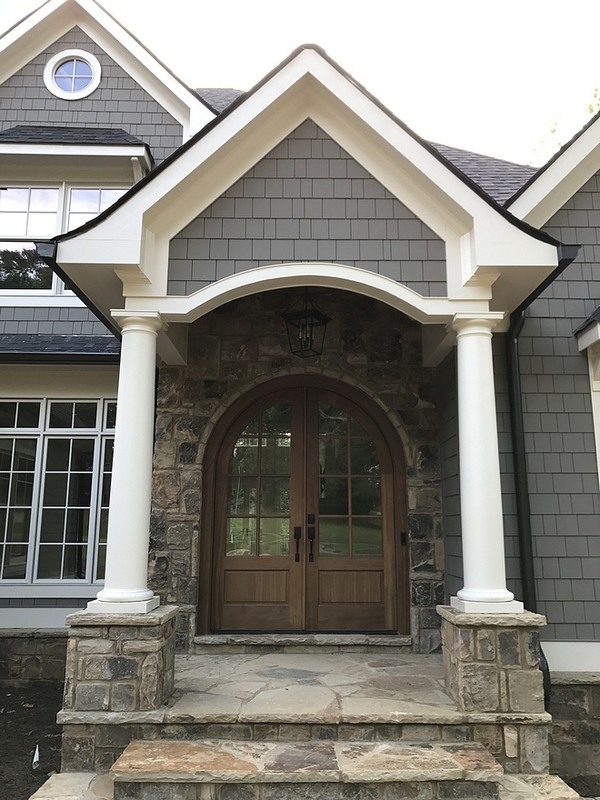 Exterior Trim Paint Color: Benjamin Moore White Dove OC-17. 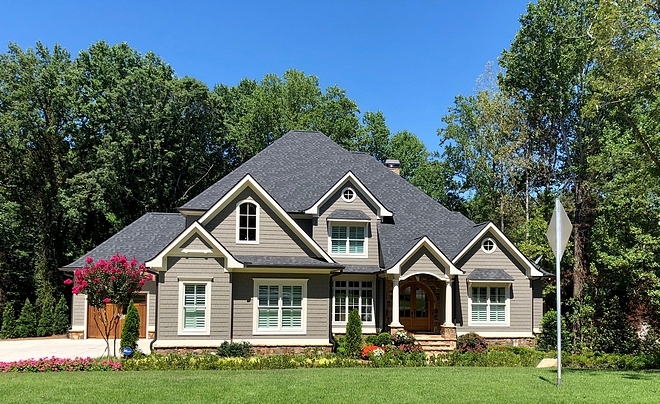 Gorgeous roof lines, transoms and round windows add to the curb appeal. Roofing: IKO Cambridge – Color: Dual Black. 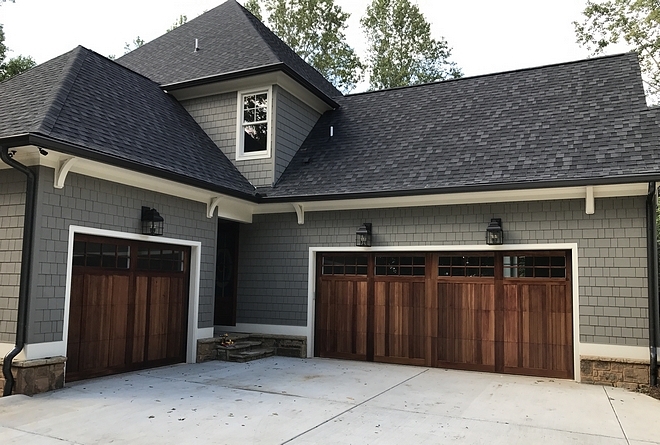 Garage doors: Cedar glazed Stockton. 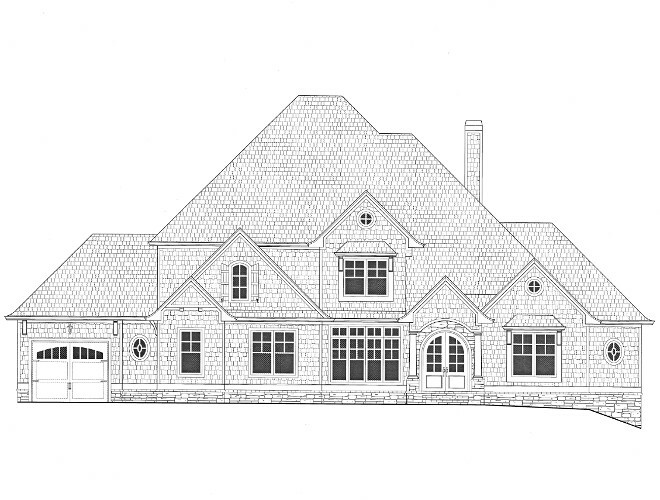 Garage Size: 908 sqft 3-car garages. 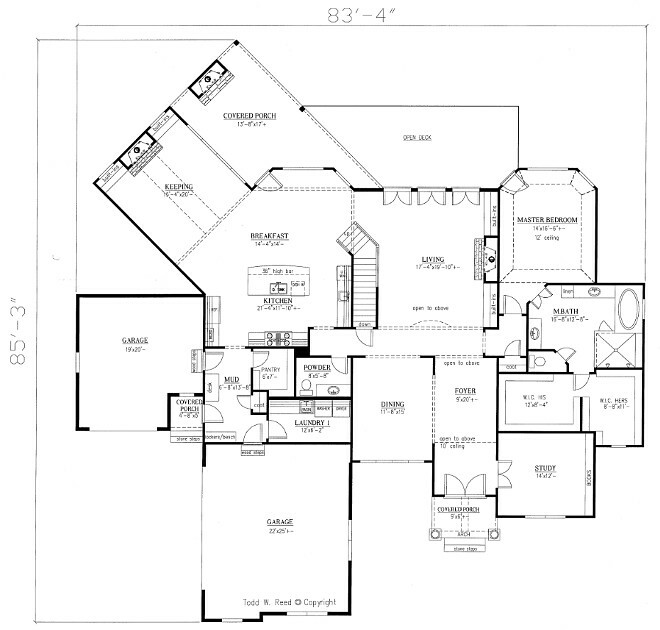 Size: 2,928 sqft 1st floor. 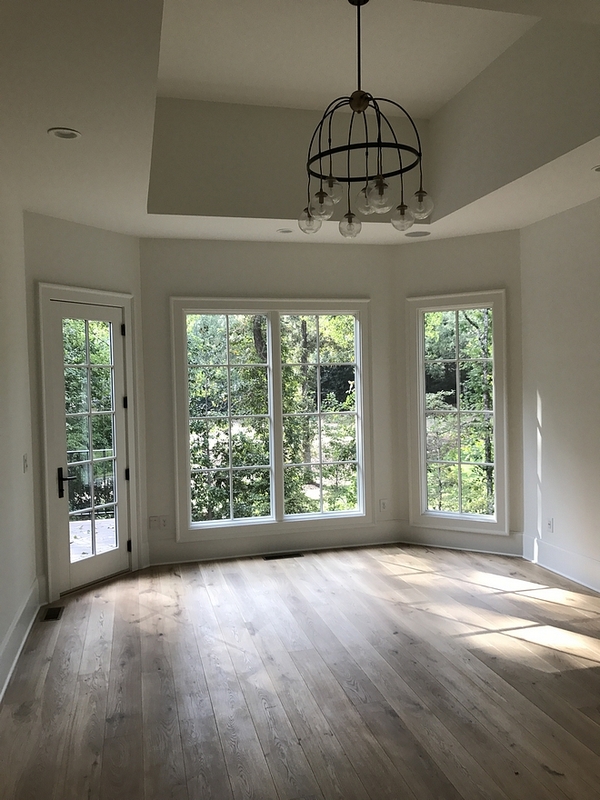 The house wasn’t furnished when these pictures were taken but I am trying to focus mostly on the floor plan, instead of the decor in this post. 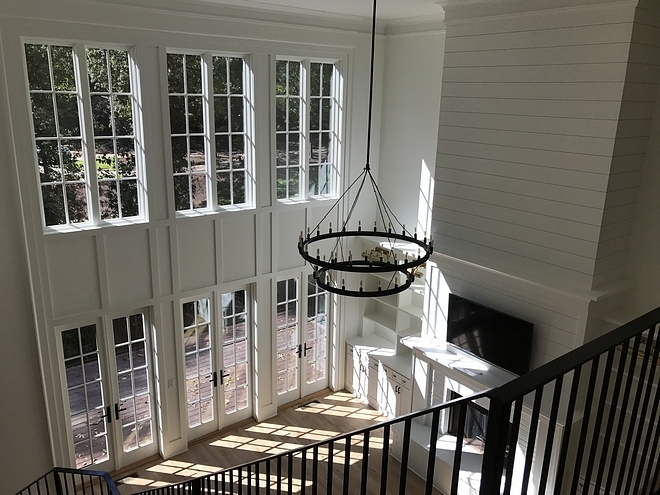 Walls throughout the first floor are painted in Super White by Benjamin Moore. 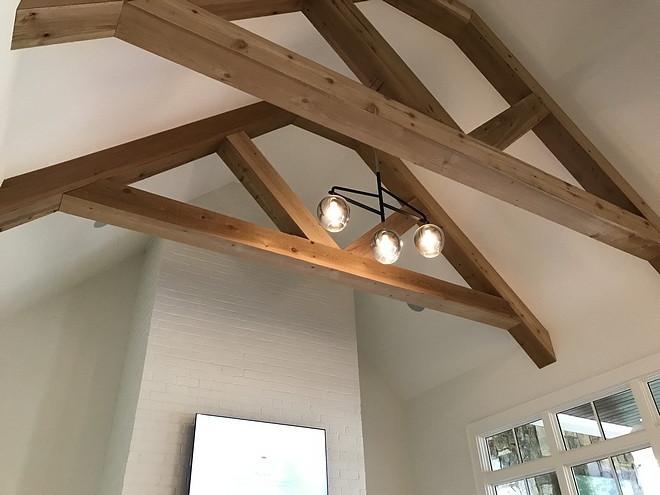 Beautiful details can be found in many rooms of this home. 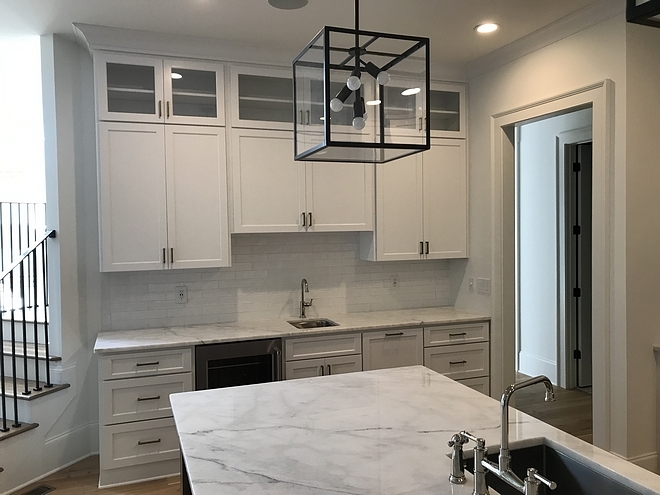 The grid board and batten paint color is Super White Benjamin Moore PM-1. Lighting: Currey & Co – large. The living room is one of my favorite rooms in this house. 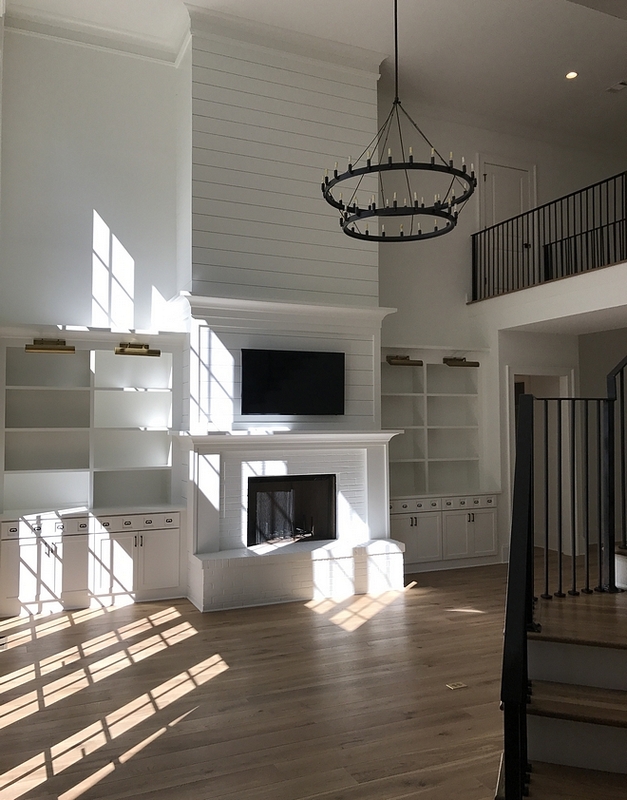 Built-ins add to the livability to the space while a tall fireplace balances the high ceiling. 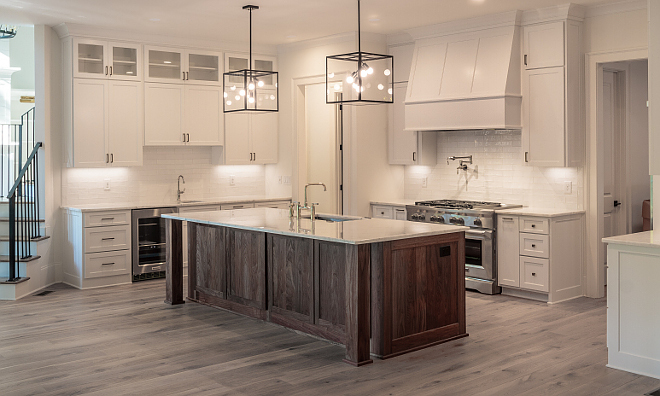 Flooring: La Famiglia Antonietta pre-finished engineered hardwood flooring – similar here & here. 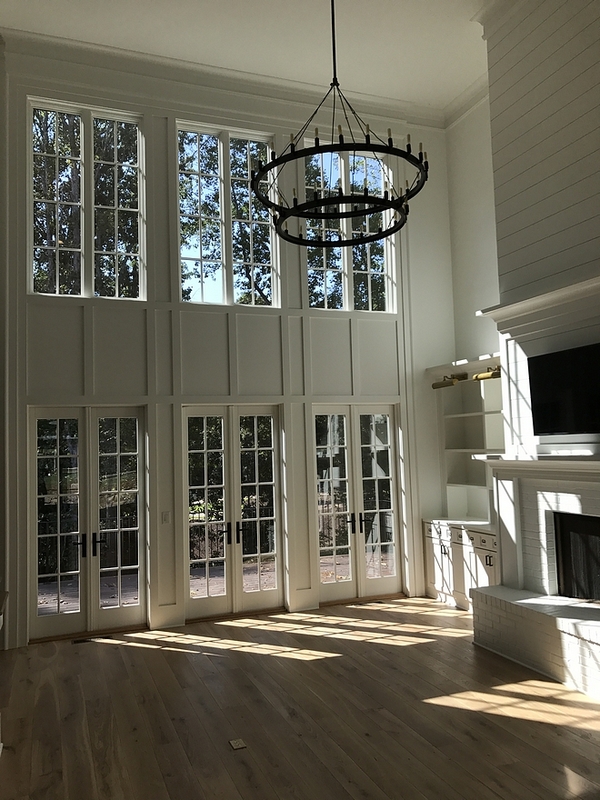 Windows & French doors are Windsor Pinnacle clad (exterior color is linen). Chandelier can be found here – similar here, here & here. 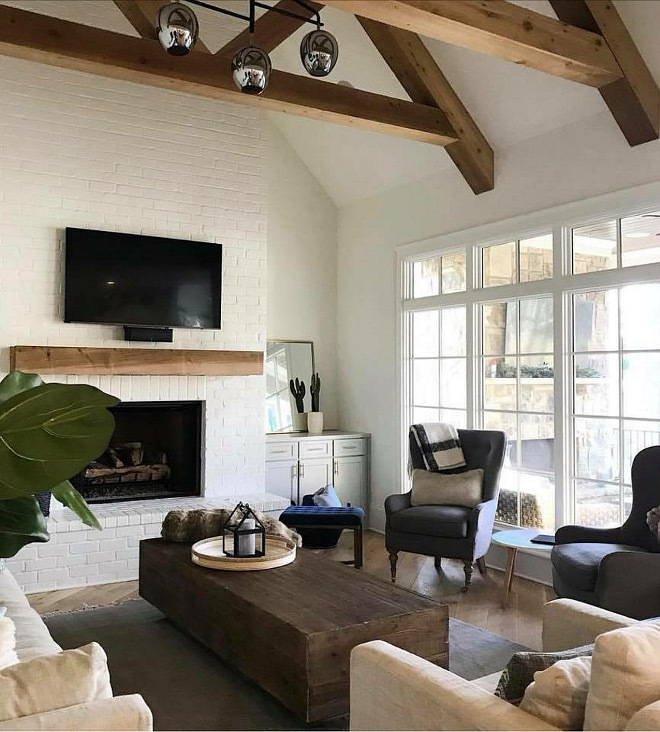 Fireplace paint color is Super White PM-1 by Benjamin Moore. 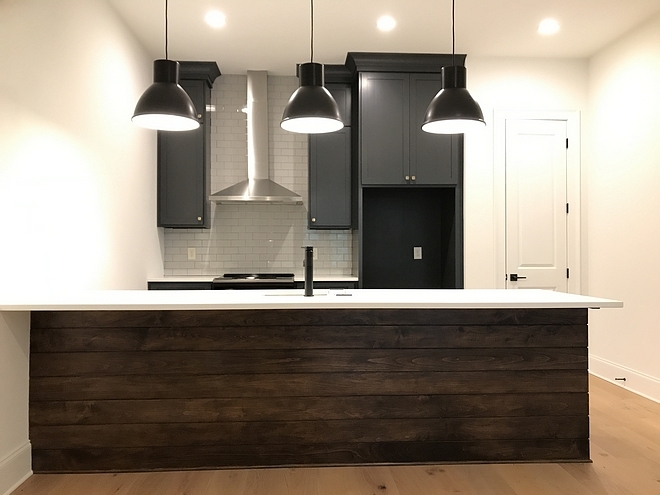 This modern farmhouse kitchen comes with a big island, a walk-in pantry and two sinks so more than one person can cook at the same time. 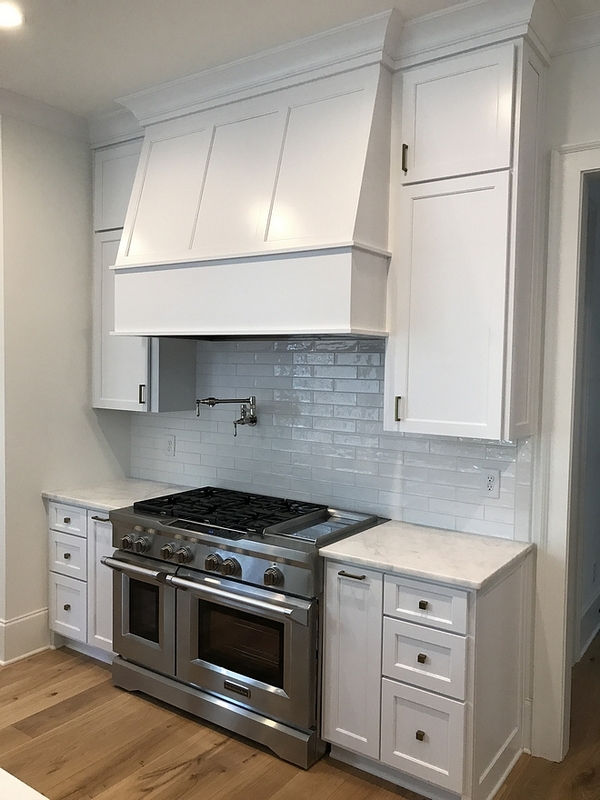 Kitchen cabinet paint color is Super White PM-1 by Benjamin Moore. 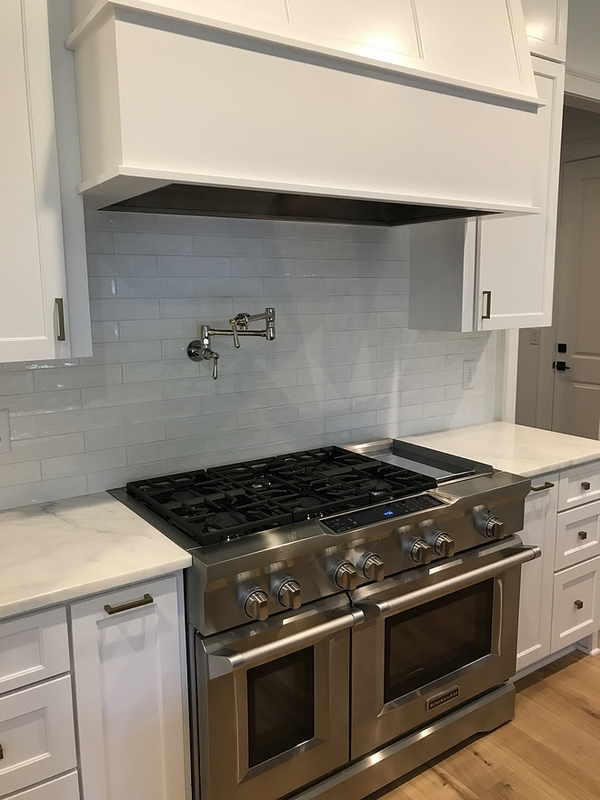 Similar Backsplash Tile: Here (2×8) & Here (3×6). Cabinet Details: Maple wood, Shaker style cope and stick door fronts, Cove crown. 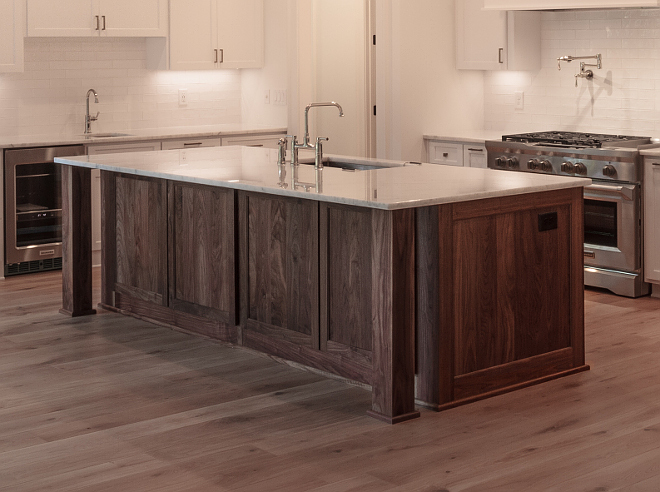 Kitchen island is Walnut (wood) in natural finish. 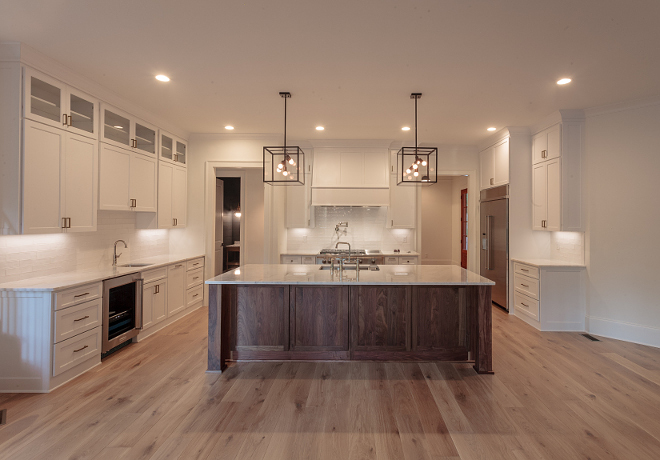 I love the combination of white perimeter cabinets with the Walnut island. 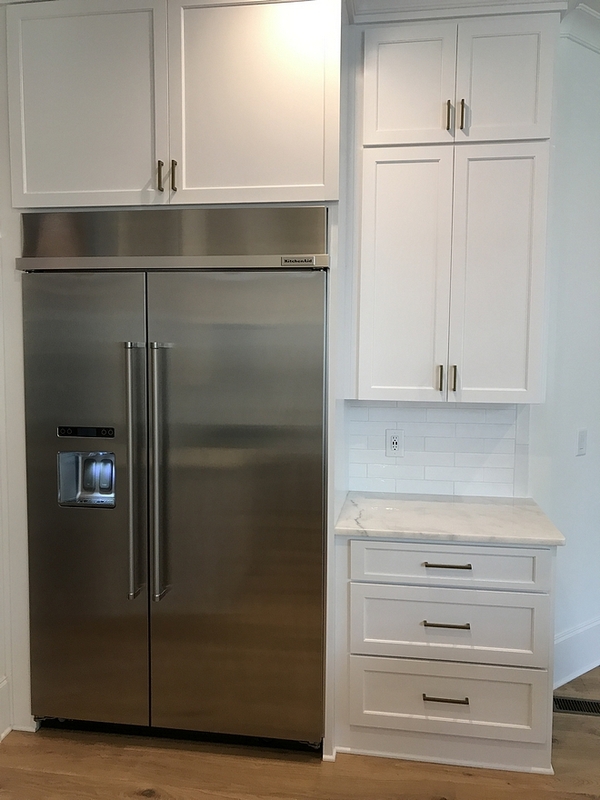 The Kitchenaid refrigerator is tucked on the right corner of the kitchen. 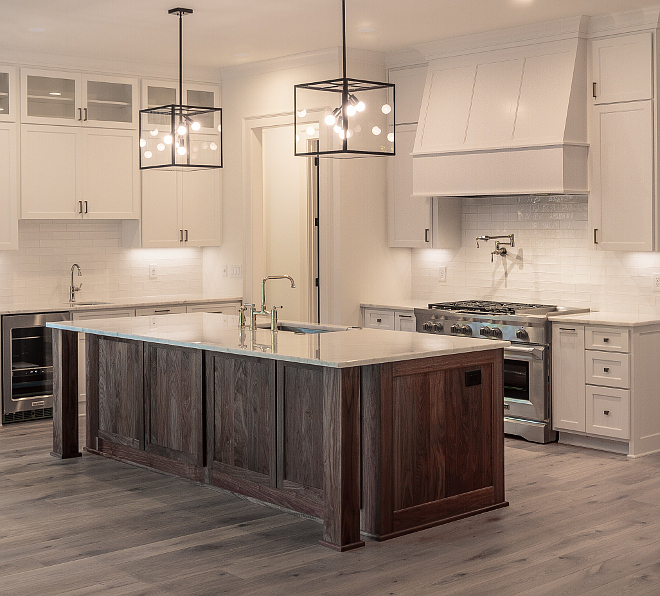 Inspiring kitchen layout! The kitchen feels spacious but everything is within reach. Notice the bar cabinet on the left. 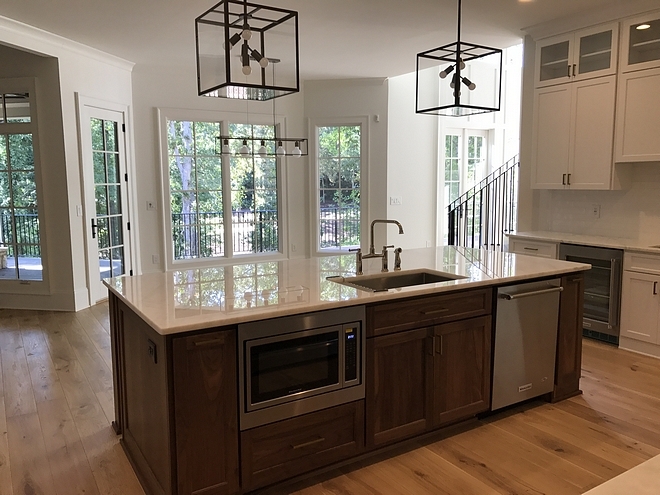 The dishwasher and a built-in microwave were placed in the island, flanking the main sink. 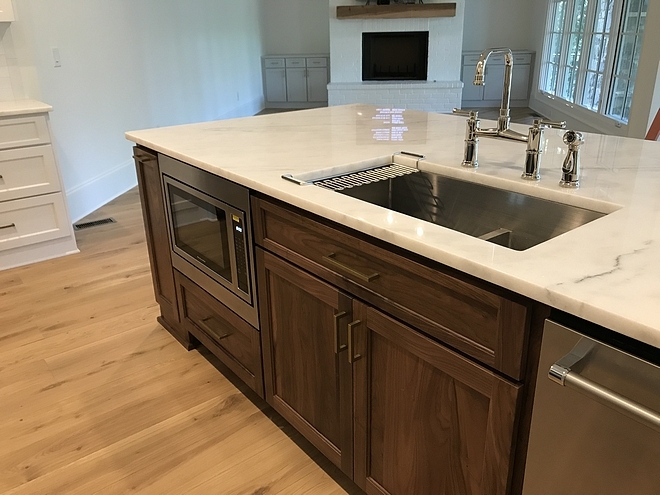 Countertop is Avalon Polished 3cm marble. Similar Kitchen Sink: Here, Here, Here & Here. 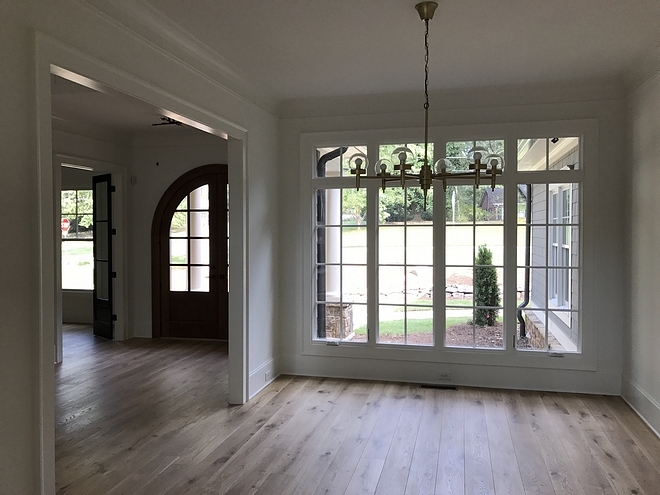 How would you decorate this space? 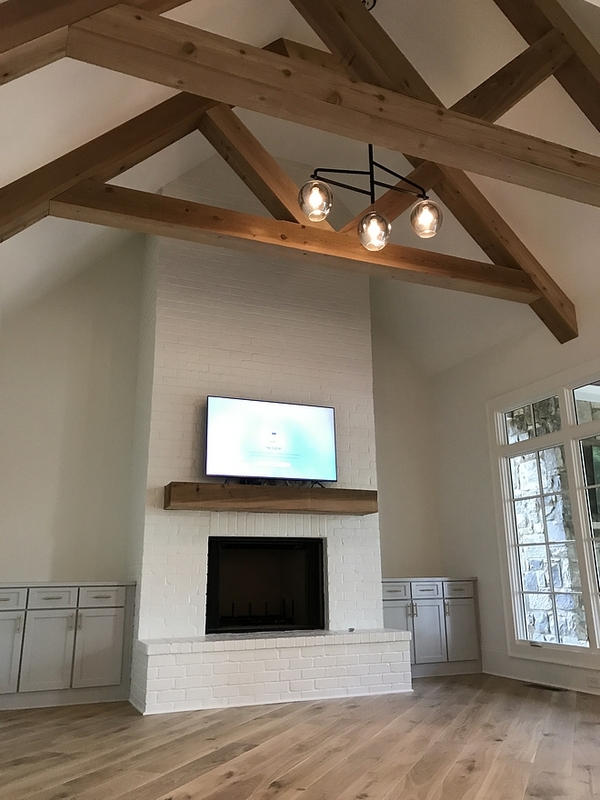 The family room is spacious and features exposed trusses ceiling and a painted brick fireplace. 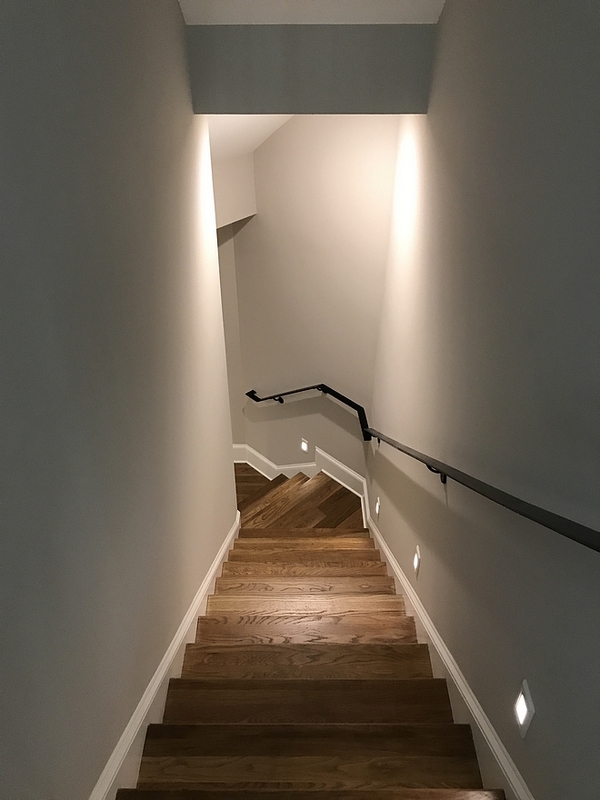 Stonington Grey by Benjamin Moore. 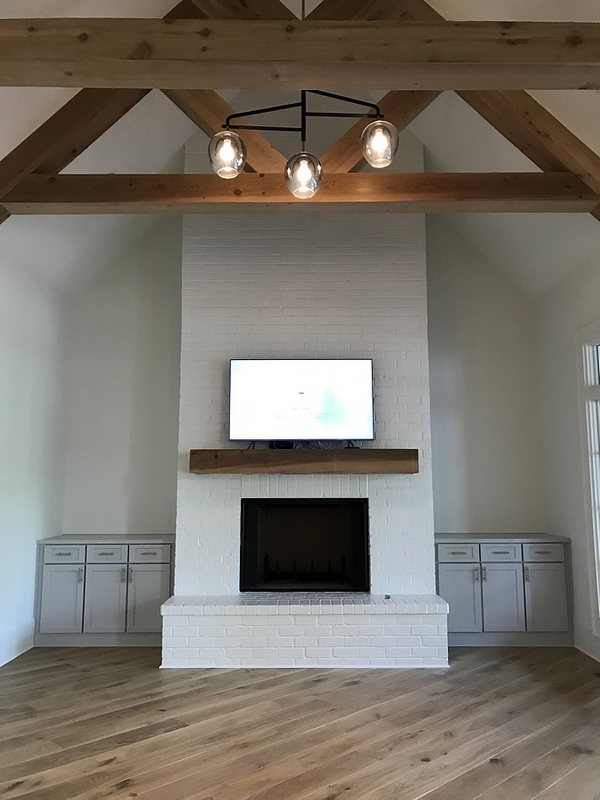 Painted Brick Fireplace Paint Color: Super White PM-1 by Benjamin Moore. 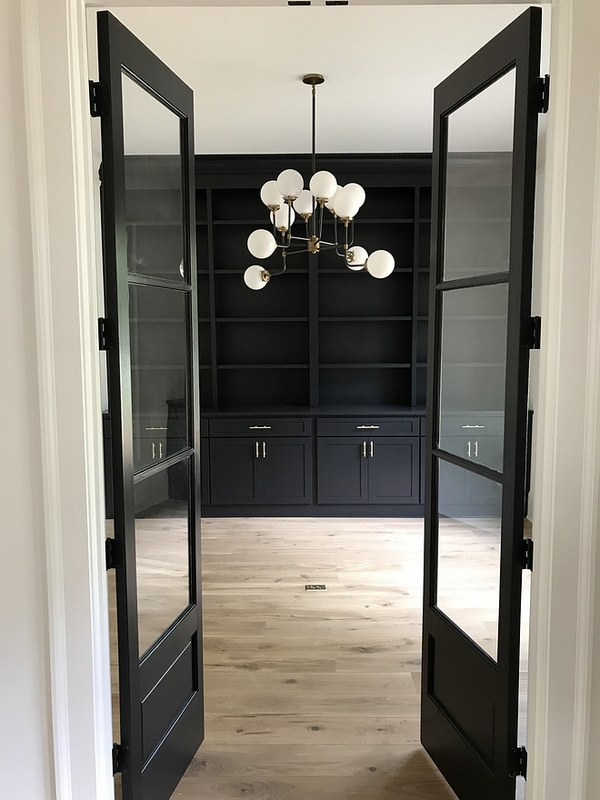 “Benjamin Moore Baby Seal Black”. 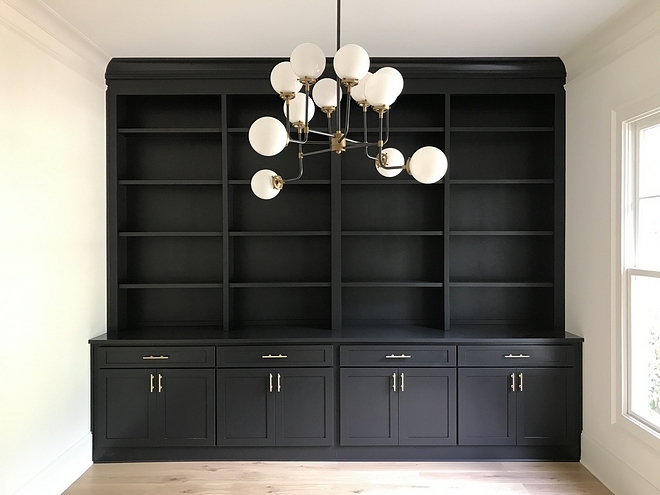 Dark cabinets and a modern chandelier bring some drama to this home office. Similar Chandelier: Here, Here, Here, Here, Here, Here & Here. 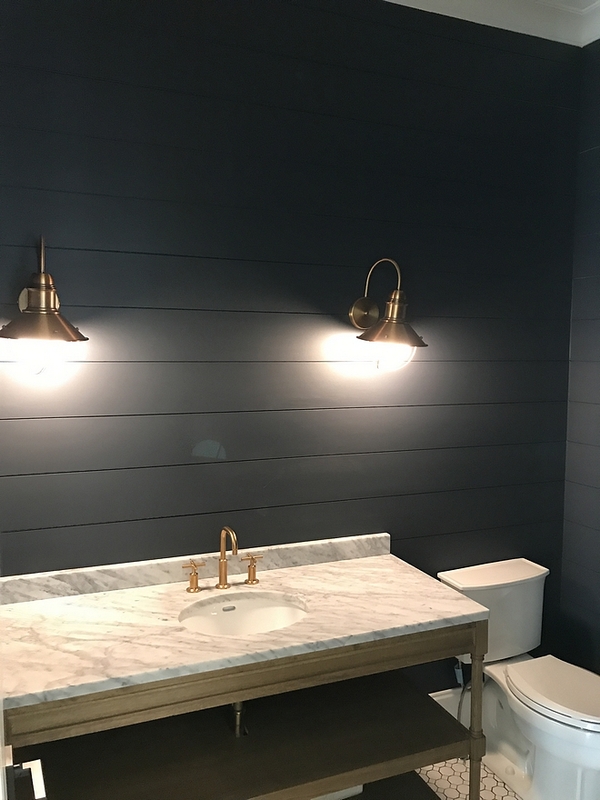 Charcoal Shiplap Paint Color: Baby Seal Black Benjamin Moore 2119-30 in flat finish. Floor Tile: Octagon and dot matte white glazed tile. 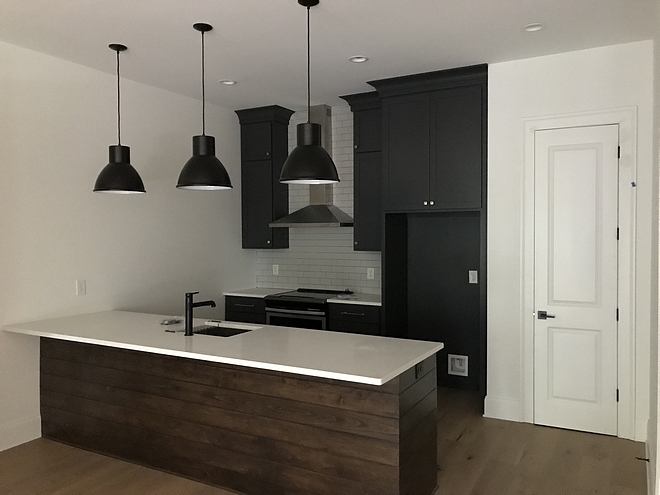 Cabinet paint color is Baby Seal Black by Benjamin Moore. 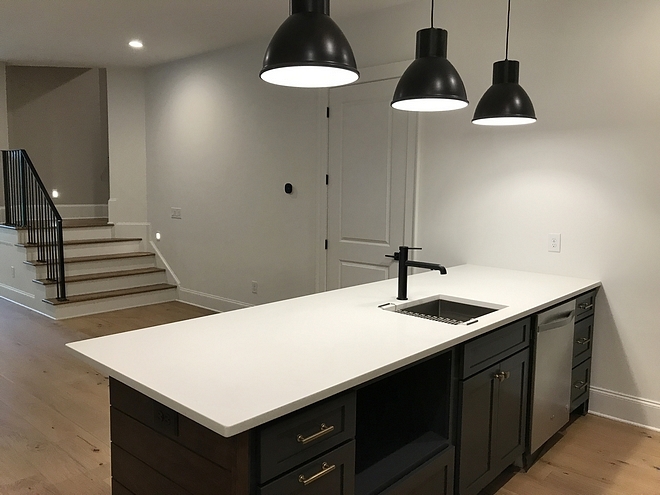 Countertop is Bella polished 3cm Viatera. Wall paint color Alabaster SW 7008 by Sherwin Williams. 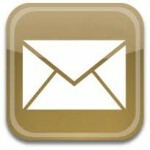 Floor Tile: Octagon and dot tile. Paint color is Benjamin Moore Calm OC-22. 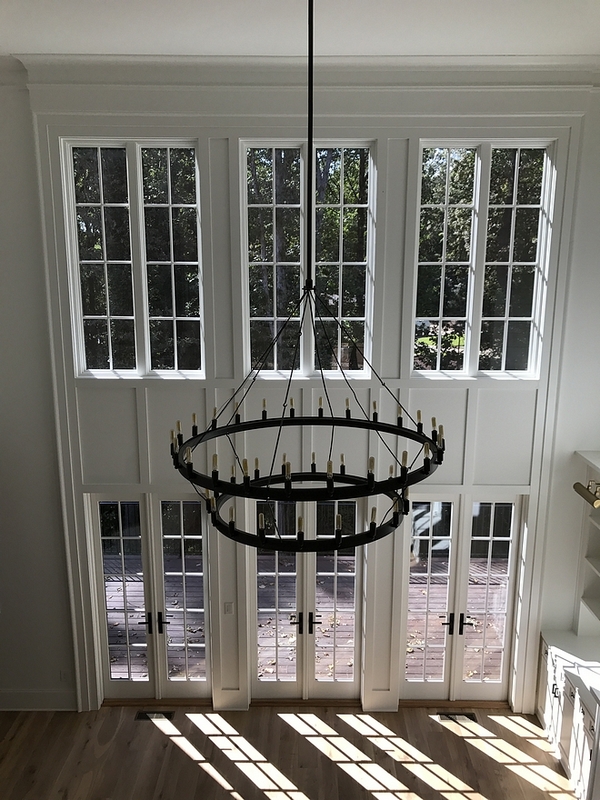 Chandelier: Here – similar here. Cabinet Hardware: Top Knobs in Polished Nickel. 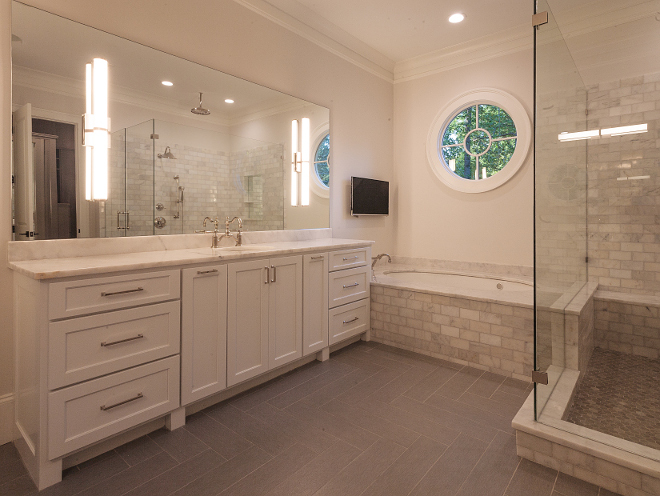 Bathroom countertop is Avalon marble. 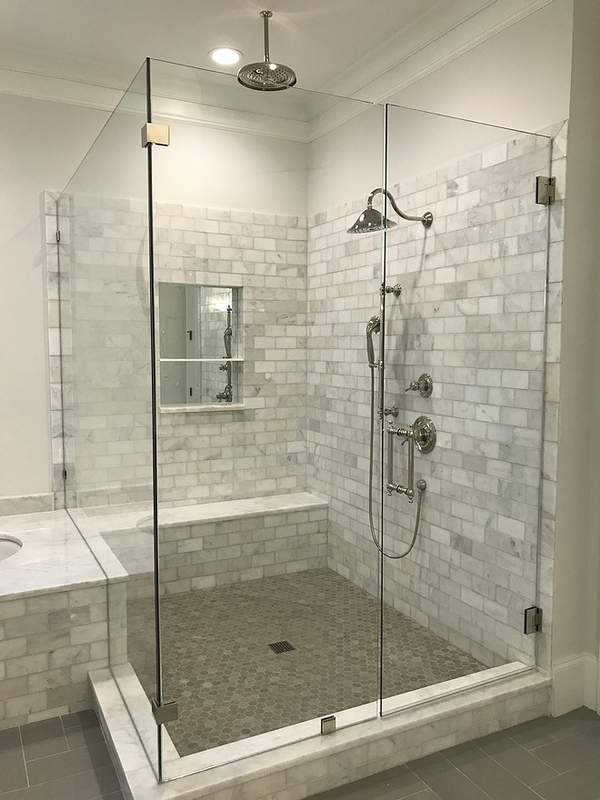 Master Shower Walls: Alba Vera 3×6 polished tile – similar here. Similar Shower Floor Tile: here. 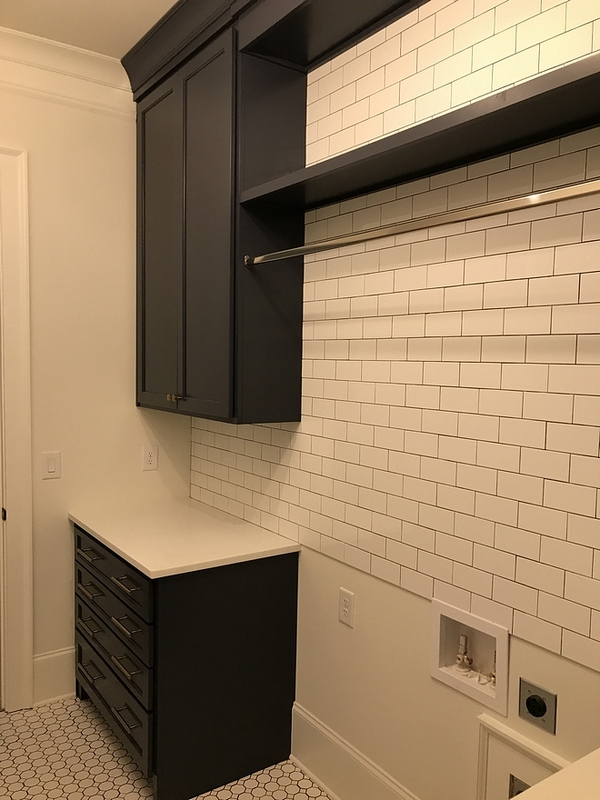 Floor Tile: Cambric Cool Gray 6×24 tile in herringbone pattern – similar here. 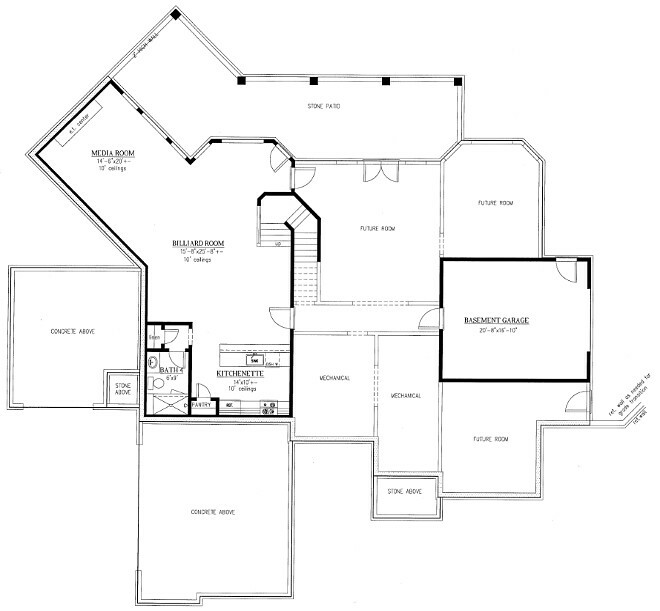 Basement Size: 1,080 sqft finished. 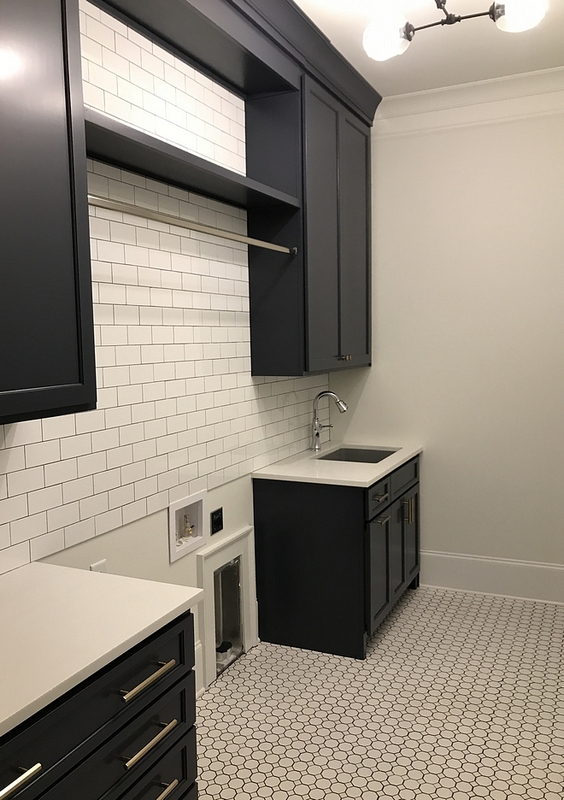 The basement features plenty of space and a great bar/kitchenette. 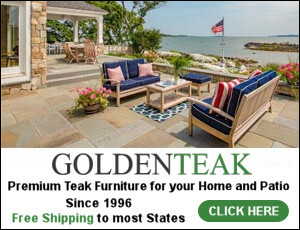 Paint color is Benjamin Moore Collingwood . 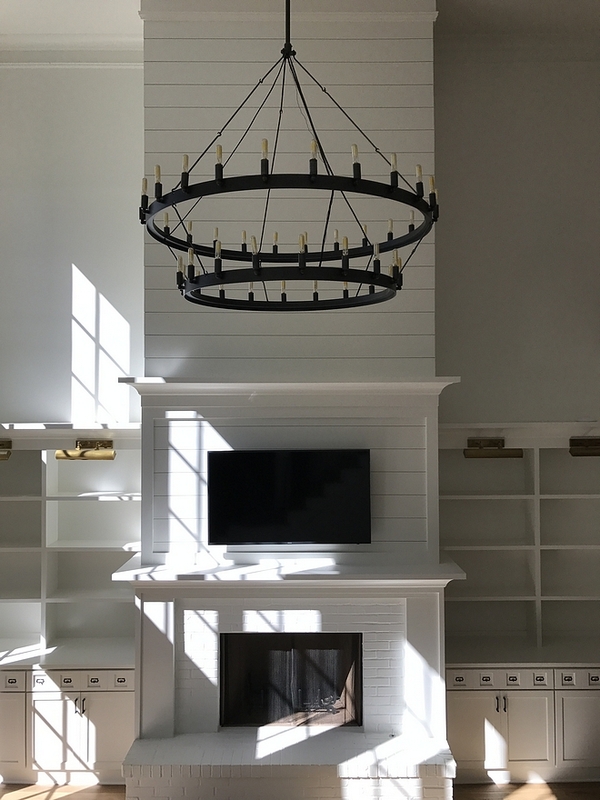 The peninsula features stained Walnut shiplap. Similar Pendants: Here, Here, Here, Here & Here. 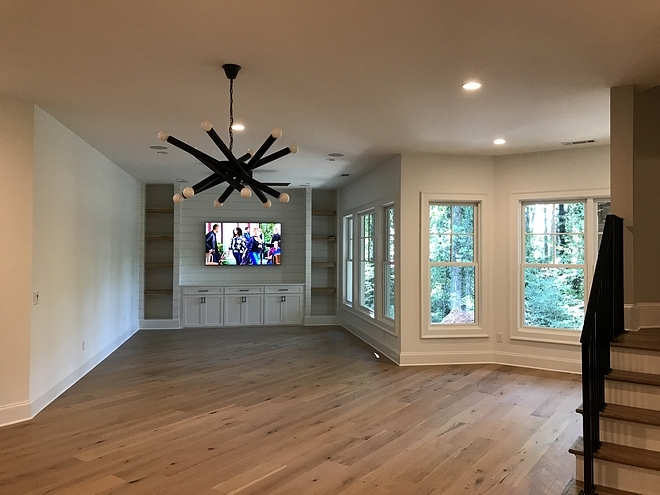 The kitchen and eating area opens to the family room. 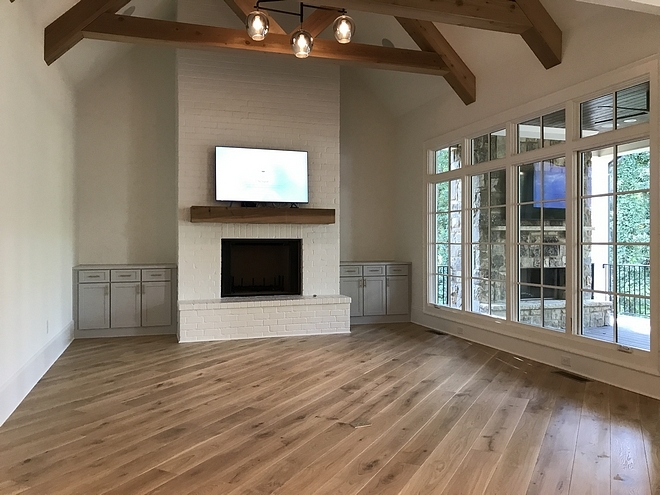 You don’t need to have a fireplace to create a focus point in your living room/family room. 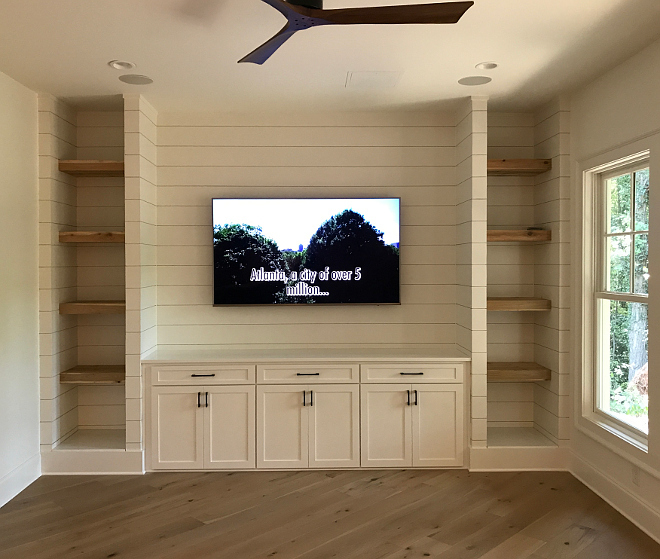 This is such a great idea for a custom built-in media cabinet for a space without fireplace. 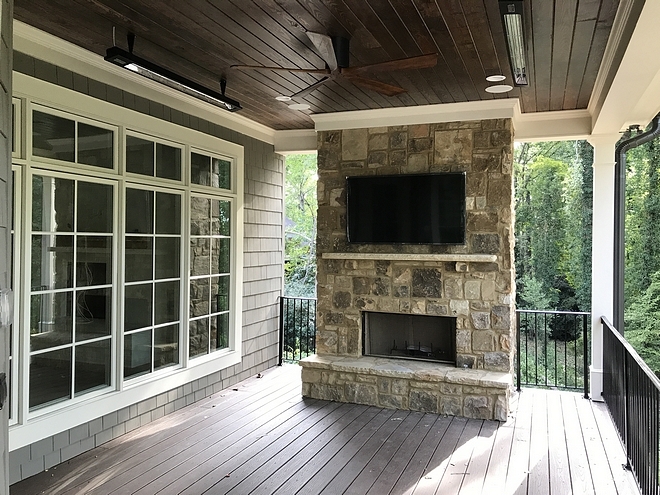 The outdoor spaces include an open deck and a covered porch. 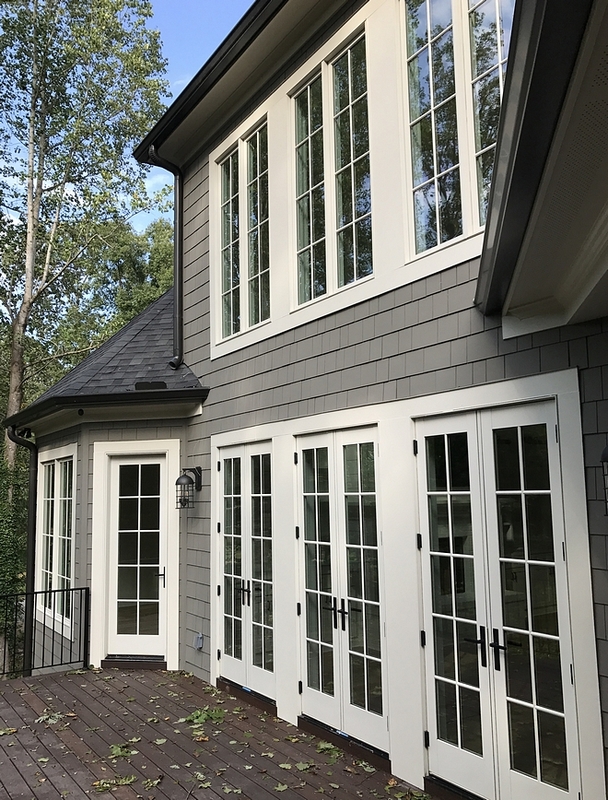 The windows and doors add some contrast against the grey siding. 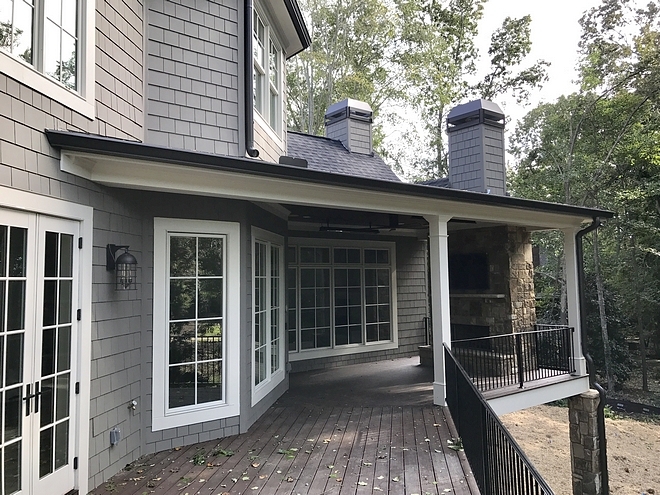 Deck: 290 sqft covered rear porch. 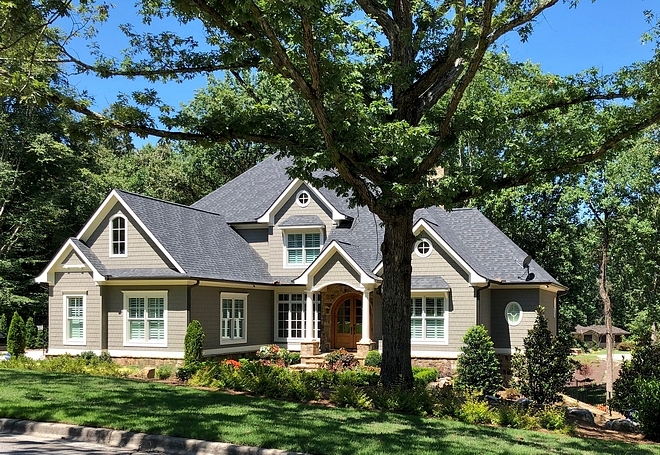 This traditional home features a beautiful and inspiring curb appeal. 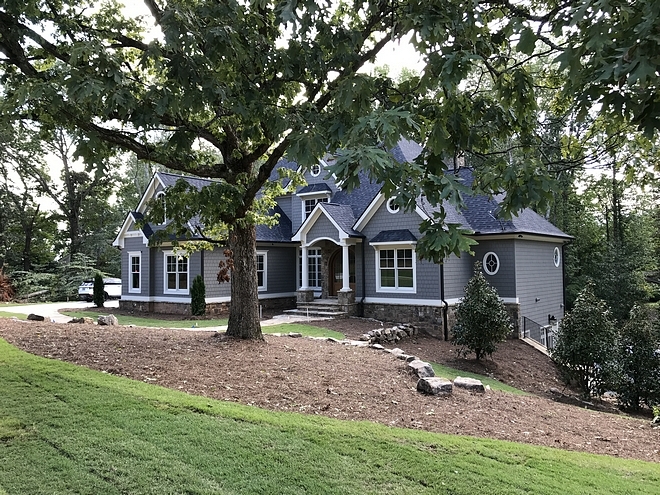 See another stunning home built by this builder on Home Bunch! 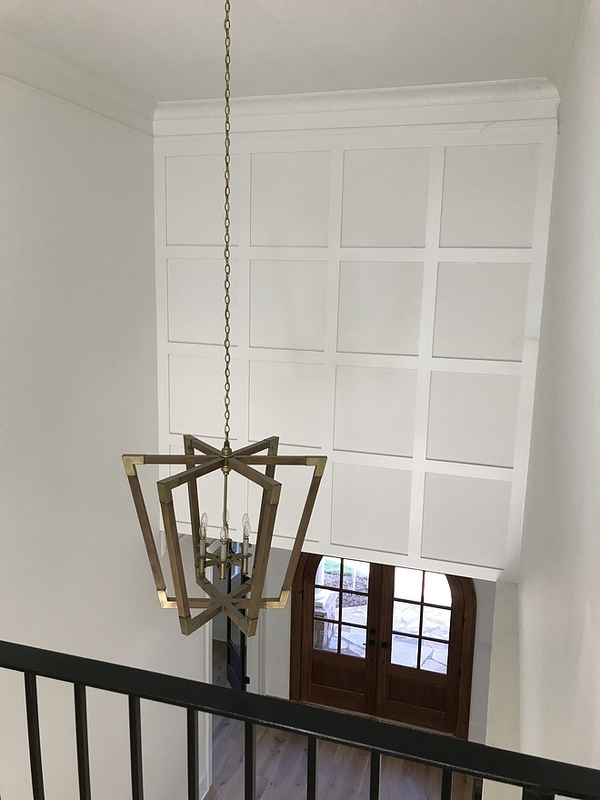 I would like to thank the architect, Todd W. Reed, for sharing all of the details above! 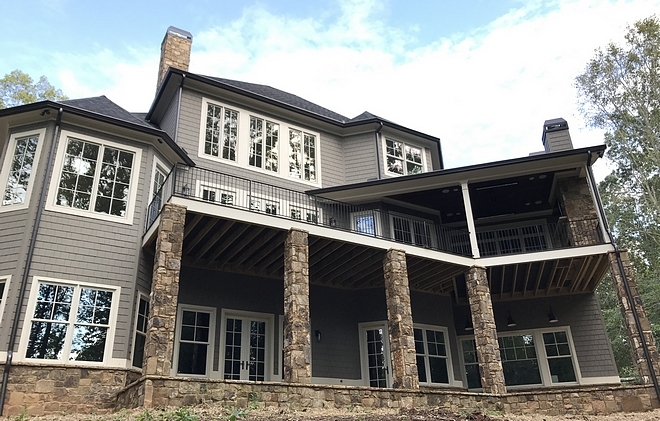 Architectural Design & Builder: Reed Brothers Design & Build – Todd W. Reed (Facebook – Instagram).